In order to understand our current oak forests, we need to look back at what has changed over the last few centuries. Prior to the 1900’s, central hardwood forests were subjected to frequent burning, either natural or human-induced. Since oaks have traits that make them more resilient to fire, they were able to out-compete other tree species less well-adapted to fire. Then, at the turn of the twentieth century, many cultural practices changed and fire suppression policies significantly reduced forest fires. Open woodlands that had been maintained by fire, livestock grazing, and harvesting became more closed as oaks in the understory were able to reach canopy positions in the absence of these frequent disturbances. Our forests today contain these mature 80-to 100-year old oaks with dense woody understories where more shade-tolerant and fire-sensitive tree species are favored. When cohorts of aging oaks die in high numbers it’s alarming, but this trend has actually been happening for many decades. 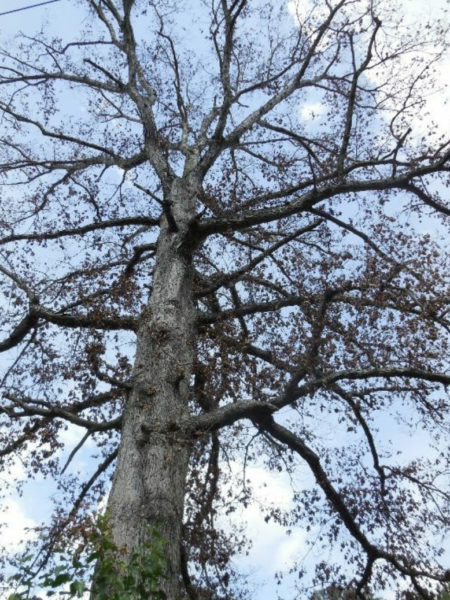 As reported the in the USDA’s 1971 Diseases of Forest and Shade Trees of the United States agriculture handbook, “The ‘sturdy oak’ in certain decades and certain areas, has revealed a marked tendency to decline and die in situations and on a scale that has caused much bafflement and concern.” A review by Millers et al. 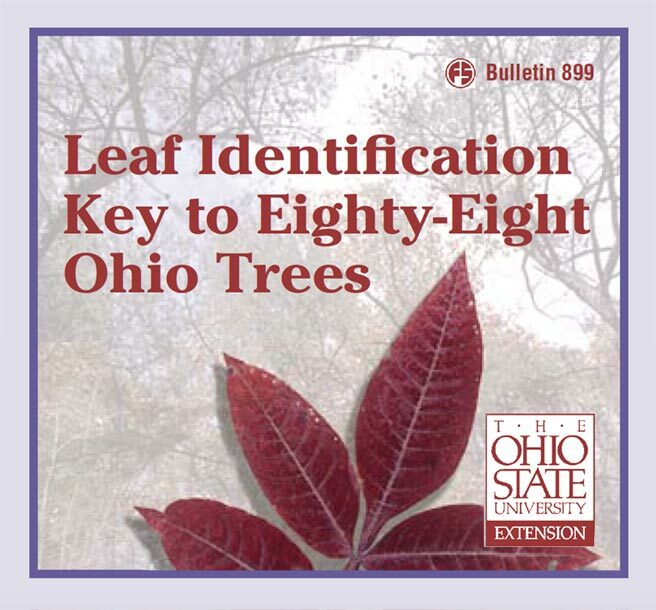 (1989) reports 57 episodes in the eastern U.S. between 1856 and 1986 where oak mortality was higher than expected. So while it may seem like oaks in Virginia are suddenly dying in significant numbers, oak decline has been a trend for some time. We define “oak decline” as the gradual failure in the health of a tree that results from the interaction among three groups of stress factors: predisposing, inciting, and contributing. Predisposing factors weaken the tree over time and often have to do with site conditions such as poor soil, topography, and stocking density. Advanced tree age and prolonged periods of drought are also common predisposing factors in Virginia. These factors reduce the tree’s ability to fight off insect and disease pests and make them more susceptible to future disturbances. Inciting factors such as frost, drought, or defoliating insects are more short-term. They rarely kill the tree outright, but usually initiate decline by reducing growth, depleting the tree’s stored food reserves, and/or causing dieback. Long-term studies show that drought events are key inciting factors and oak response to drought can last up to 10 years. Finally, contributing factors are secondary insects or diseases that ultimately lead to tree mortality. These are the agents that finally “do the tree in” and are often blamed for the death of the tree when in fact they are just the last nail in the coffin. 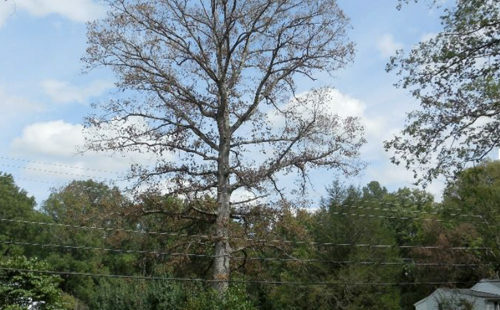 Common contributing factors in Virginia are Armillaria root rot and the two-lined chestnut borer, a fungus and wood borer, respectively, that only attack trees already in an advanced state of decline. So you can see why the answer to the question, “Why are my oaks dying?” can be very complicated. Your dead oak may be infected with Armillaria root rot, but that’s not what killed the tree; it was just a contributing factor. Your oak may have been defoliated by gypsy moth, but that was just an inciting factor that initiated decline. Old age and prolonged drought many years ago may have actually started the decline, which in combination with defoliation and Armillaria root rot, eventually killed your tree. Oak decline is a complex disease with no single causal agent. 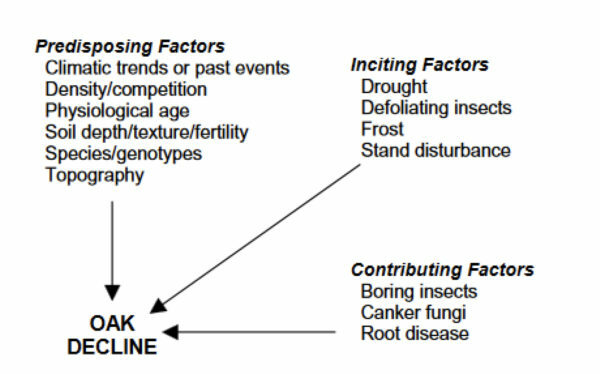 Causal factors of oak decline organized by their function in the decline syndrome. From: Starkey et al. 2004. The earliest visible symptom of oak decline is crown dieback, which progresses from the top down and the outside in. This crown dieback reflects an impaired root system usually due to root rot, a contributing factor. Once oak decline is initiated, tree mortality follows after a few years or even decades and, unfortunately, nothing can be done to reverse this trend. In an aging stand, oak decline is a natural ecosystem process, and oak composition in our forests will likely continue to decrease. However, there are a few things you can do to predict where oak decline will take place and possibly minimize the damage. Crown dieback is the first visible symptom of oak decline. This white oak is clearly showing signs of decline. Photos by: Lori Chamberlin, VDOF. Predictive factors for oak decline include site quality, stand age, and stand density. Sites that are dry, along ridgetops, and/or have coarse shallow soils are more at risk. Mature trees (greater than 70 years old) and overcrowded stands are also more vulnerable. In addition, long-term monitoring and research show that the red oak group is more susceptible to decline than white oaks. Preventative measures that maintain the health and vigor of trees are the best way to prevent oak decline, or at least extend the life of a tree. Thinning overstocked stands and promoting species diversity is recommended. If you are planning a salvage harvest in the face of oak decline, talk with a forest professional about how to encourage oak regeneration; regeneration techniques should be initiated before cutting. As our cohort of oaks reach mature ages, oak decline is inevitable. Forest inventory analysis shows that the abundance of oaks in Virginia is decreasing, while species such as tulip-poplar and red maple are increasing in volume and number of stems. Silvicultural prescriptions that favor oaks should be utilized when possible, but even if these practices are employed, other factors such as invasive plants further complicate the matter. Our forests are changing just like they did centuries ago. Hepting, George H. 1971. Diseases of Forest and Shade Trees of the United States. United States Department of Agriculture, Forest Service. Millers, Imants; Shriner, David S.; Rizzo, David. 1989. History of hardwood decline in the Eastern United States. Gen. Tech. Rep. NE-126. Broomall, PA: U. S. Department of Agriculture, Forest Service, Northeastern Forest Experiment Station. 75 p.
Lori Chamberlin is the Forest Health Manager, 434-220-9026, lori.chamberlin@dof.virginia.gov.